This is a slightly different iteration of a favorite outfit of mine starring chambray and denim. They go with everything: prints, neons, silk, wool, leather, your birthday suit... Here I'm toning down some scary bright colors. How do you use chambray/denim in your wardrobe? I absolutely love this skirt! The orange is great (and I say that as a lukewarm fan of it!) and so flattering on you. My favorite way to use chambray in the summer is to tie and knot it in the middle of my outfits to make it cooler. In preparation for fall I am wearing it a lot with my colored skinnies. I love Ikat prints. I think they are super fun! Hi Anna. I gladly found your blog through Style Journey and glad to be among your followers. Chambray and Denim are great though I don't own a chambray shirt yet but need to rectify that soon. 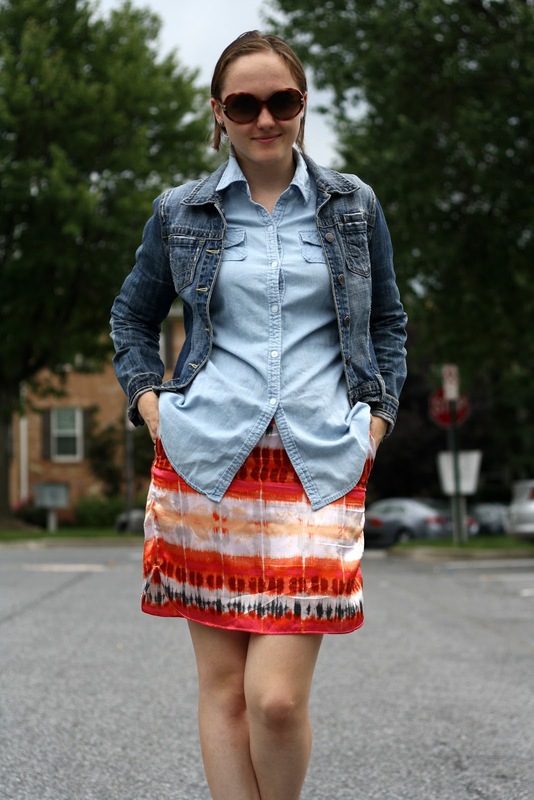 I love this little Ikat Tie-Dye skirt of yours. And I must say girl, you have beautiful porcelain skin. I am loving this outfit!! I don't have much chambray and denim really but you my dear have inspired me to go out and gget some!! So cute lovely outfit as always sweet girl!! Is it awful that I still don't have chambray in my closet even though I've been planning on getting it forever? I love how you've worn it here. And I totally am in lust with your sandals! What an unusual skirt! I really love how it looks with the shirt and jeans jacket. The photos are just incredibly great. Really enjoying the fact taht you paired denim adn chambray on top...it's really fun and striking, plus it's a great neutral backing for that fantastic ikat. I love this! Perfect casual yet chich outfit! The hole look is so fresh,but i'm so into this skirt! Love this outfit! The denim jacket over the chambray looks great!